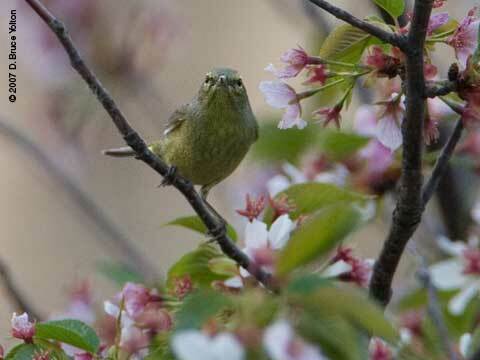 I got into the park on a sunny, warm Spring evening. 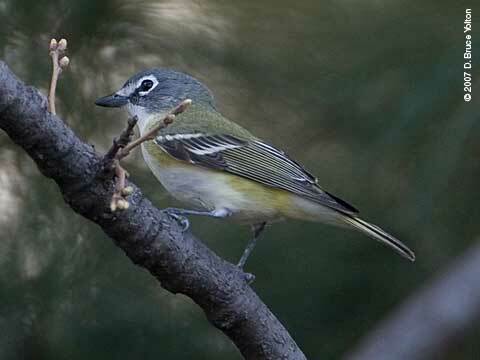 The park was full of birders. 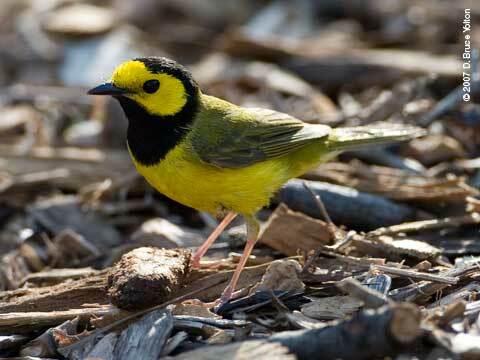 I was able to photograph a Whip-poor-will and a Hooded Warbler. 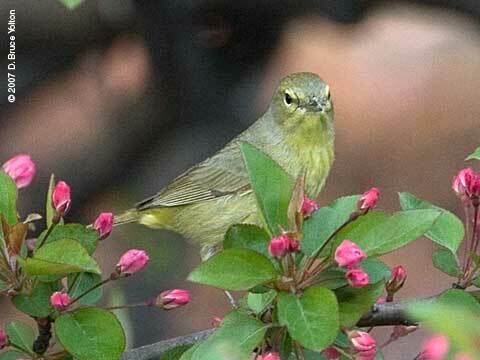 The Whip-poor-will was a new bird for my Central Park list. 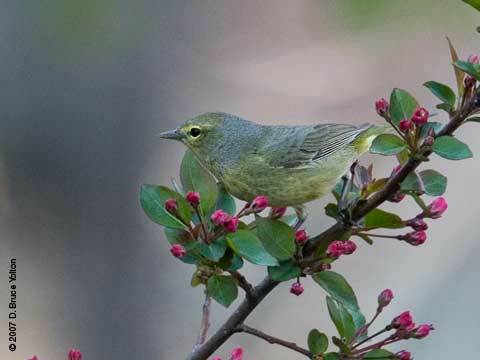 I spent an hour doing some "normal birding" while the spring migrants were still in the park. 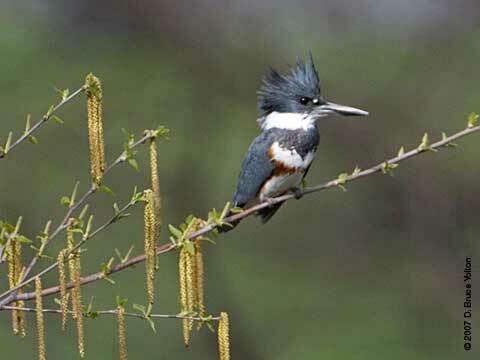 I got this shot of a Belted Kingfisher. 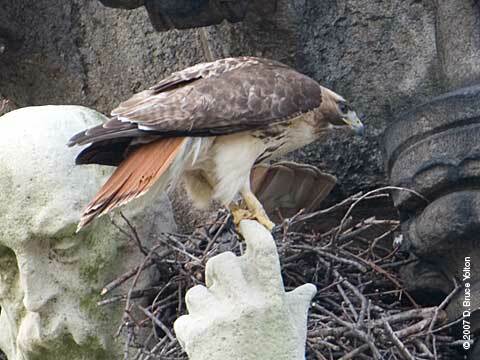 There were plenty of clues on Saturday, including food being taken into the nest, lots of feeding behavior, etc. 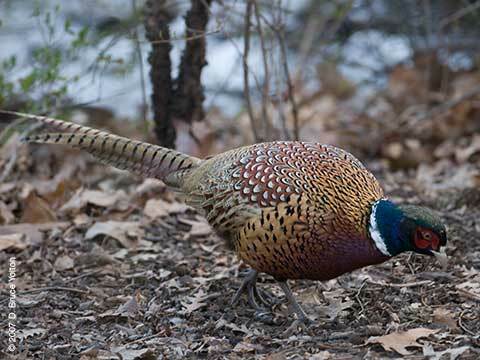 In the morning, when I arrived, no one was to be seen. 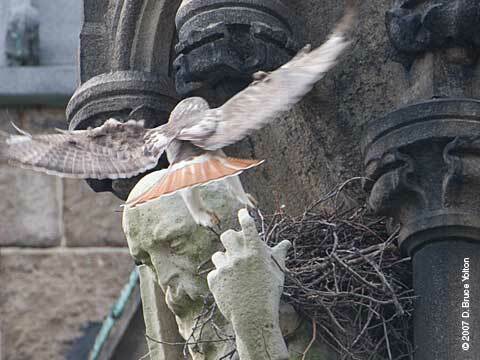 Soon the adult male arrived on the Archangel. 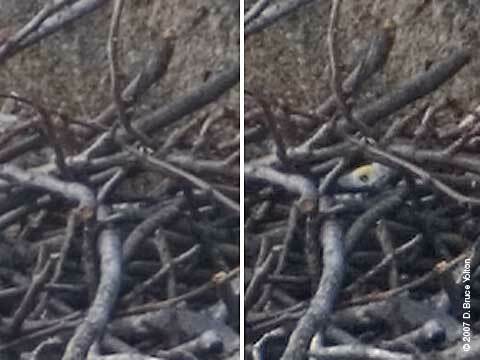 Through gaps in the twigs, I thought I saw a chick. 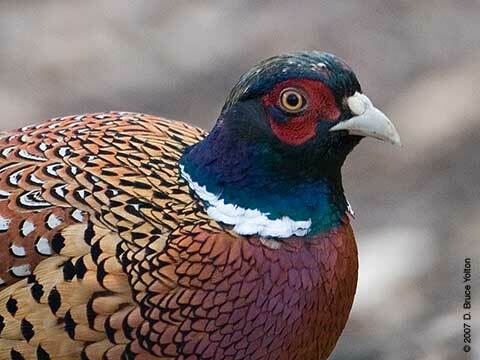 Here I thought I saw a head with two eyes briefly. But it could be wishful thinking. 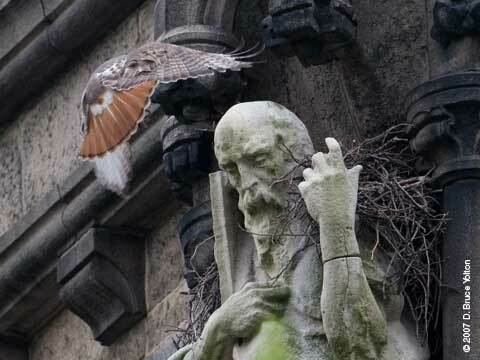 I'm not sure who's flying in. 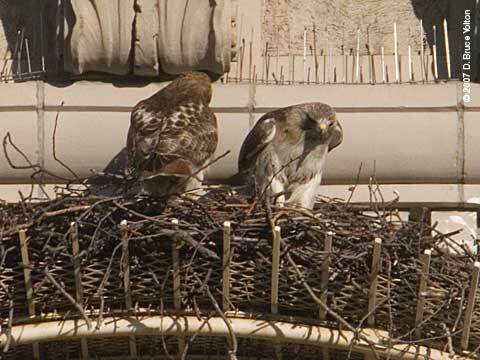 Both parents on the nest. 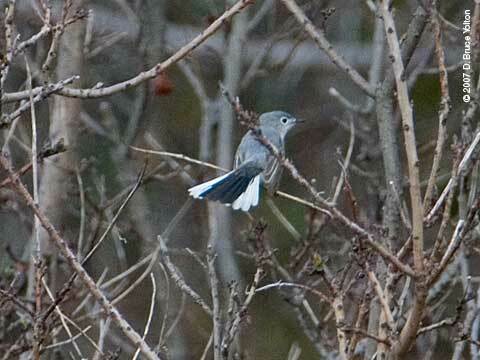 Note the tail on the left. 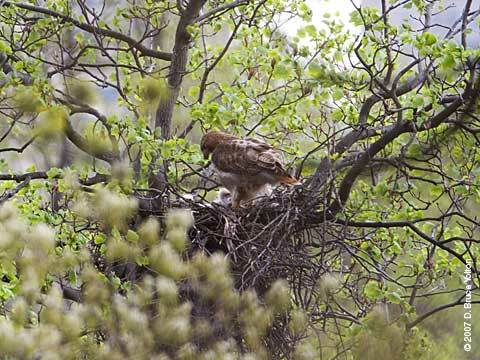 ...leaves the nest, and I go up north to Highbridge and Inwood Hill. 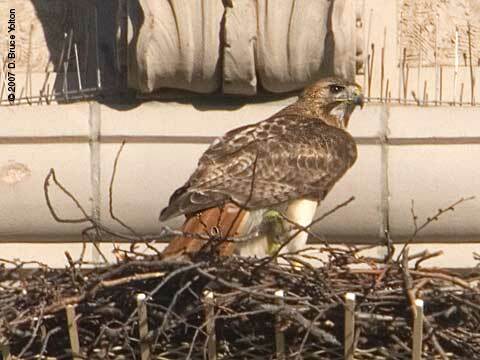 In the afternoon, I return around 5:00 p.m.
All is quite until the male comes in with a rodent. 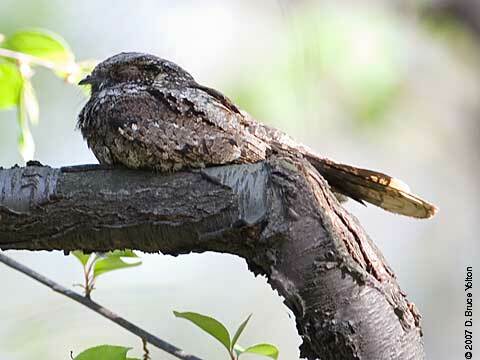 He moves to a higher branch and soon goes to the nest. 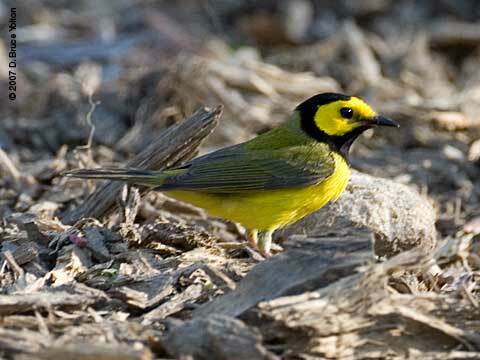 The male landing on the nest. 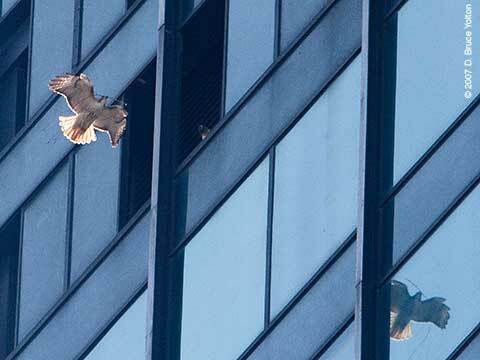 His mate watches him leave. 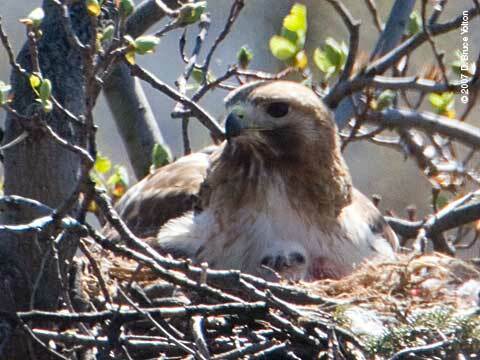 And then the female settles in. 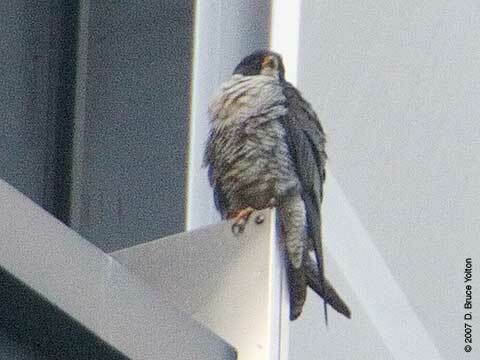 However, much higher than when she was sitting on eggs. 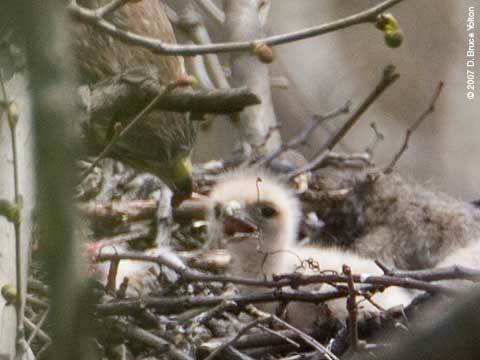 The leaves are coming out and it's becoming harder to find a spot to photograph the Highbridge nest. It might become impossible in a few weeks. 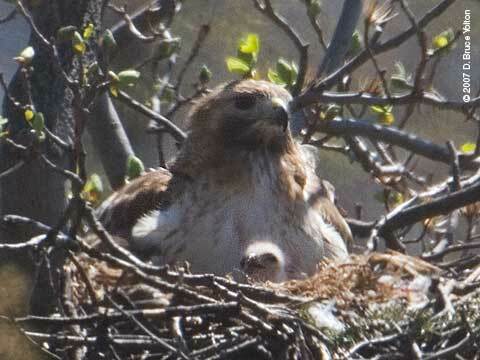 The mother (just peaking out on the left), and the three eyasses. 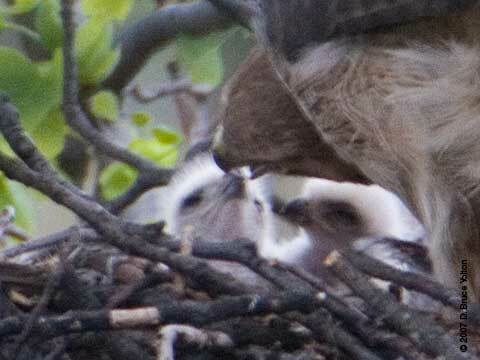 I had only seen two tiny eyasses last week, so the third was a nice surprise. 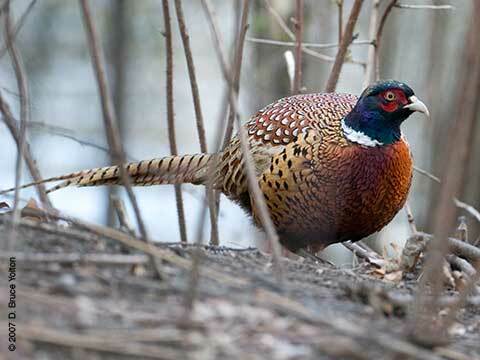 They were fed during my visit. 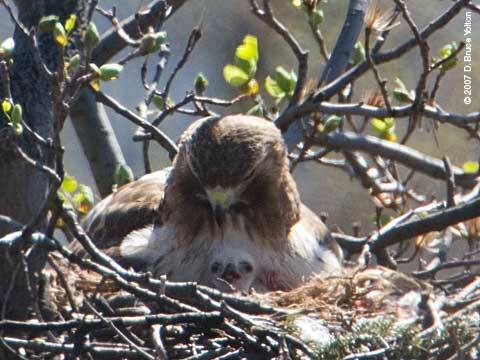 The feeding over, the father let the mother have a break and let the eyasses enjoy the sun. 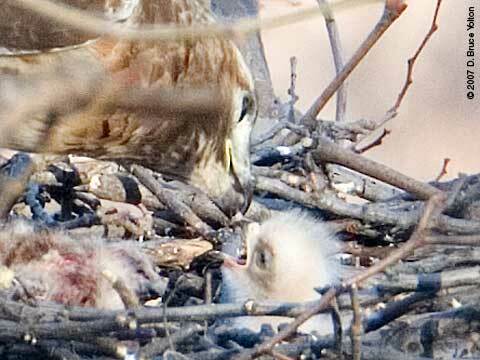 Young eyasses can be too small to see at first, so hawk watchers depend on seeing feeding behavior. 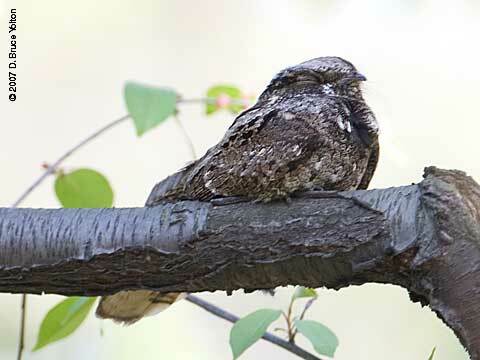 There were two such nest reports that came in via email today. 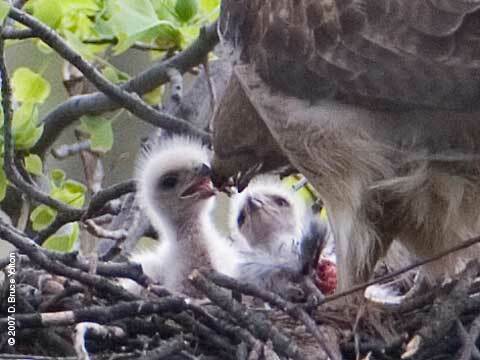 One came from Chris Lyons, who watches the Fordham hawks in the Bronx entitled, I THINK I just watched Rose feeding chicks. 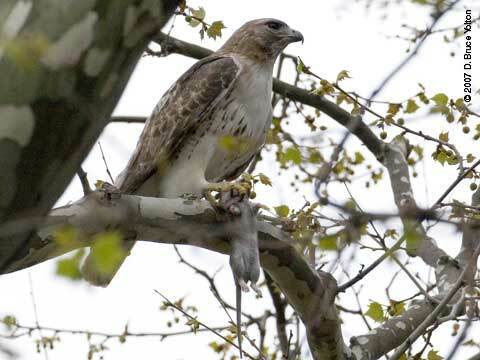 "I was about to give it up as a lunch hour mainly wasted (ONE good shot), when Hawkeye showed up out of nowhere--didn't see if he was carrying prey, but he probably was. 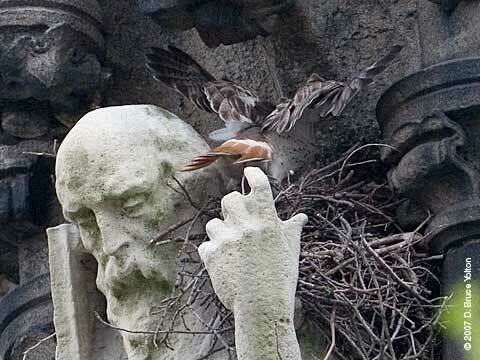 Rose spent quite a good while hunched over the nest, with her head bobbing, and Hawkeye was looking down into the nest with great interest. He stayed a long time. 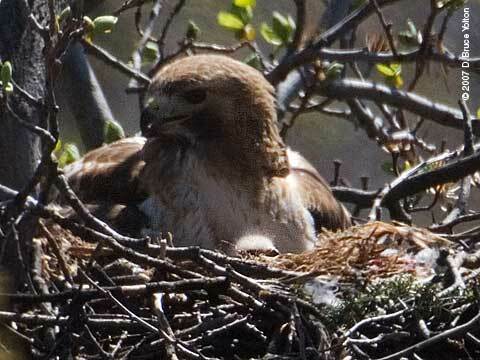 Eventually Rose settled back down on the nest. She's been taking a lot of breaks lately, without him relieving her. 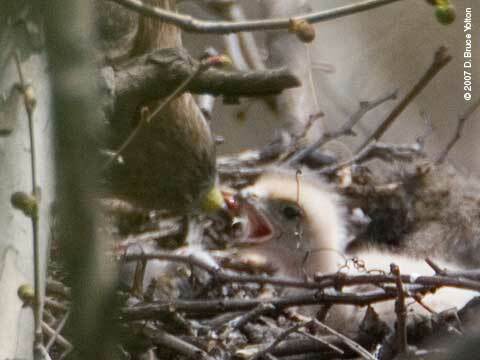 I never saw any chicks, but I wouldn't expect to at this point...Not 100% sure, but 95%, at least. " 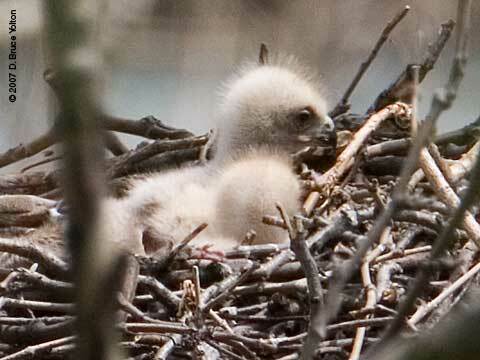 The other came in from Robert B. Schmunk entitled, Cathedral hawk babies. 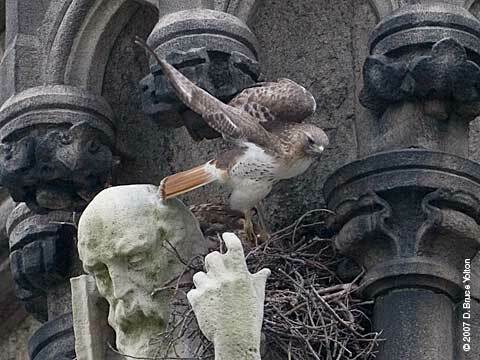 It looks like the hawks at Cathedral of St. John the Divine have had an egg hatch, as there was definite feeding behavior going on today just after 7:00. 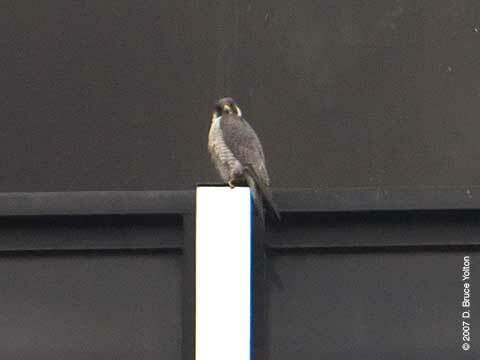 Tristan had been hunting in the weeds alongide the northwest parking lot at the Cathedral and was observed to fly back to the nest with a mouse. 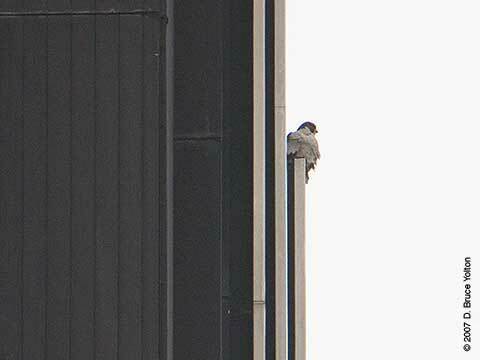 He stayed there for a few minutes, and after he left Isolde was seen to be leaning into the nest in a manner typical of a feeding. 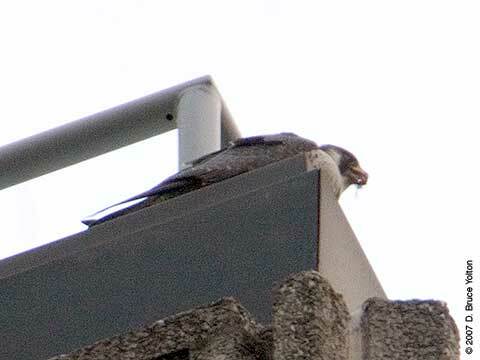 Donna Browne was watching with her scope and probably can provide better details of the feeding. 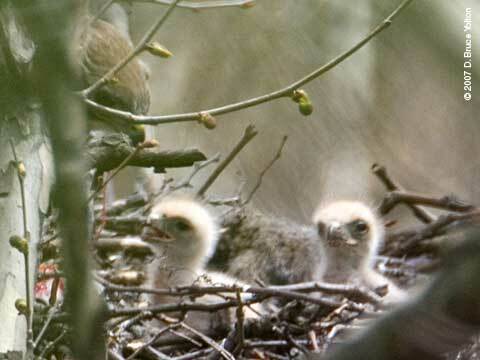 At one point she indicated that it looked like Isolde was provide tidbits in two directions, as if there two nestlings. 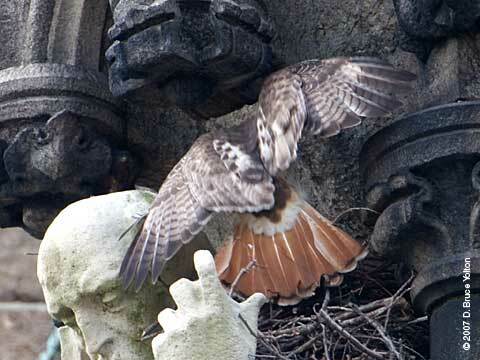 Tristan returned with part of another mouse or rat at 7:30, but that appears to have been saved for a later meal." Anyone have a view of 888 Seventh Avenue? 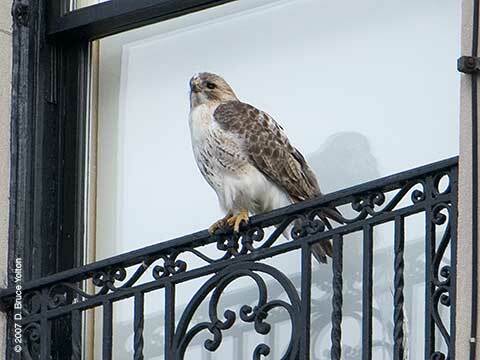 The new location of the Central Park South hawk's nest on 888 Seventh Avenue can't be seen from the street. 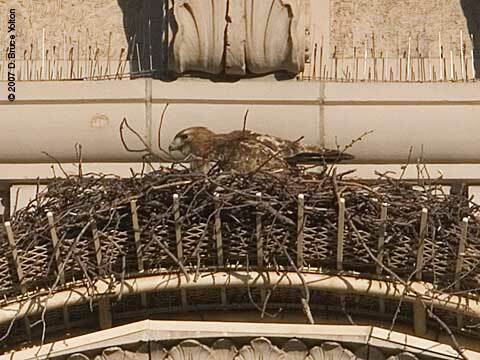 The nest is on the east face of the building between 56th and 57th Street. 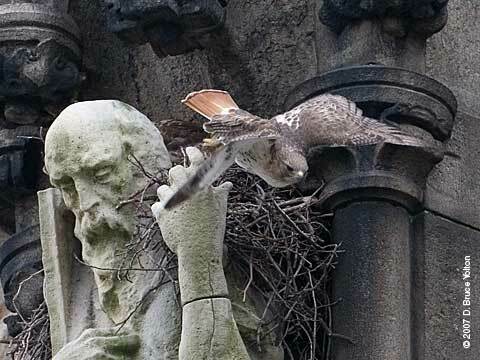 Does anyone have a view of the nest? It's twelve stories down from the top of the building. 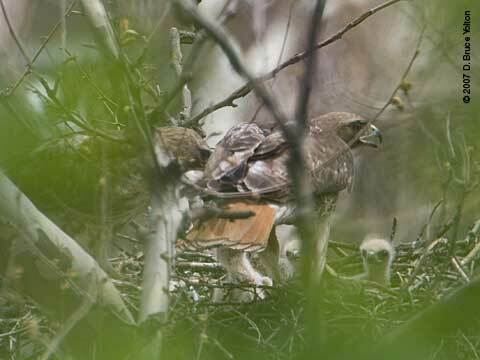 Update: Lincoln Karim has some great shots of the nest on his site, www.palemale.com. 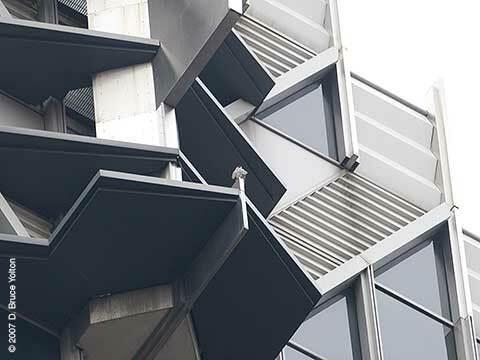 The nest, which I originally thought might have been behind the vents, is sandwiched between a faux window, and the vents. It seems like a very secure location, free of rain, wind and direct sunlight. 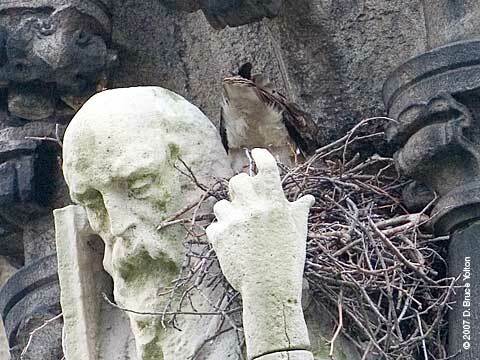 The actual nest placement, is one set of windows north of where I had originally thought the nest was located. 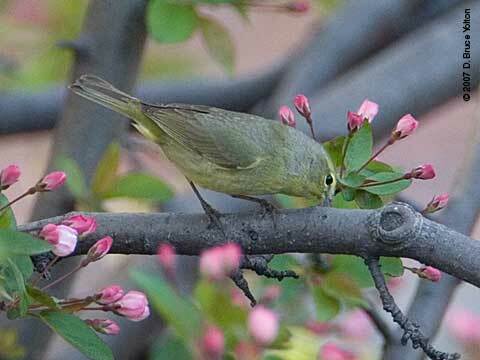 An Orange-crowned Warbler has been in Central Park near Belvedere Castle. 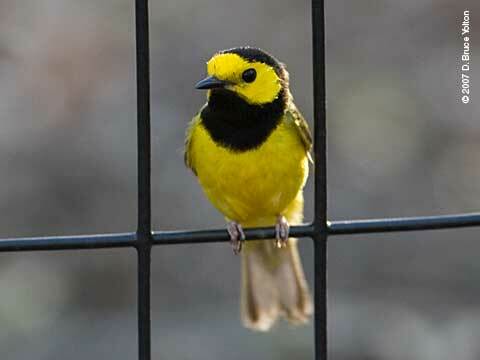 The light was making it difficult to photograph the bird, but I got to add a new bird to my Central Park bird list. 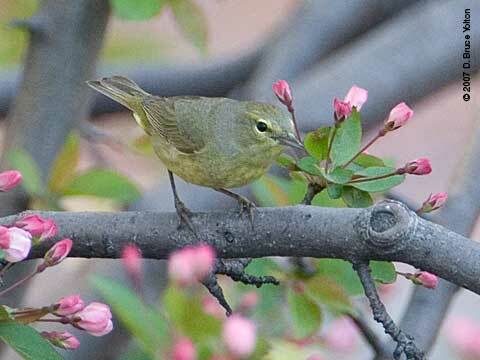 As often happens when lots of birders gather, two hard to find birds were also spotted while we waited for the Orange-crowned Warbler, a Blue-headed Vireo and Blue-gray Gnatcatcher. 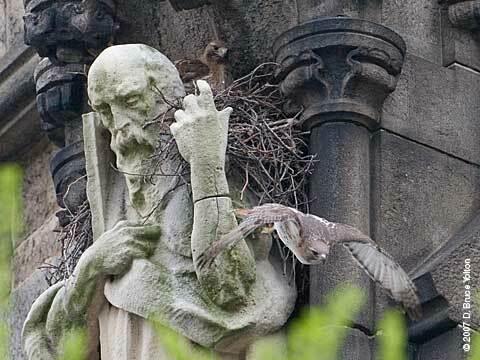 I went by the Cathedral Church of St. John the Divine on my way home from Inwood Hill. 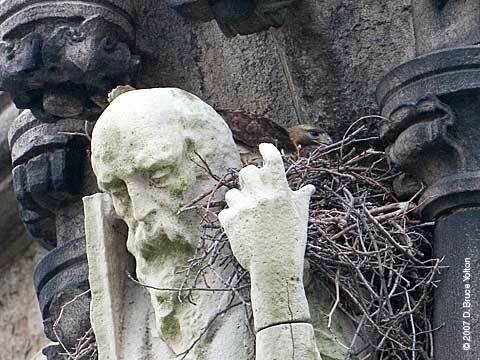 As usual for this nest, you couldn't see the sitting hawk. 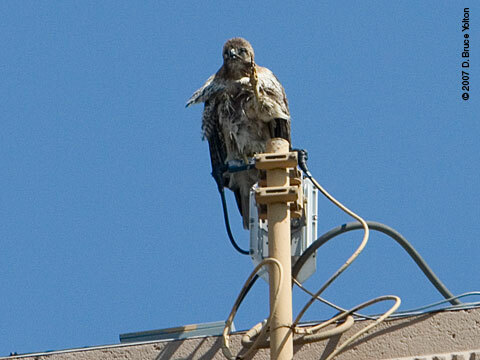 I went down to 110th and saw a hawk on 301 West 110th Street. It looked all wet. It hasn't rained for two days. 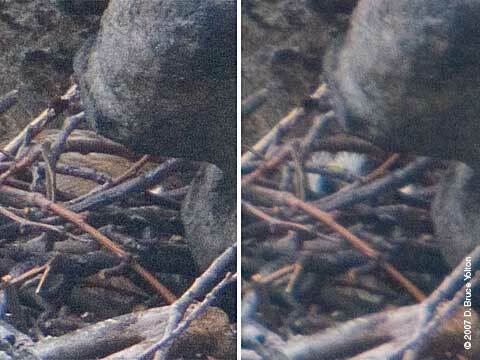 Did the nest fill up with water during the Nor'easter and are they incubating the eggs on a water logged nest? 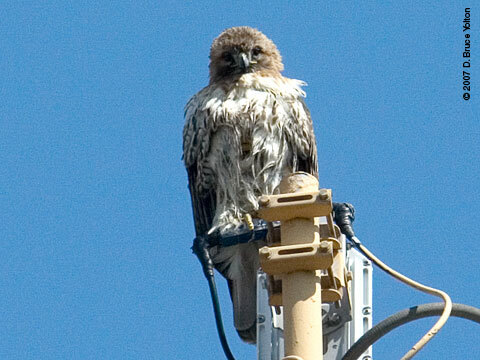 Or did the hawk just take a bath somewhere? 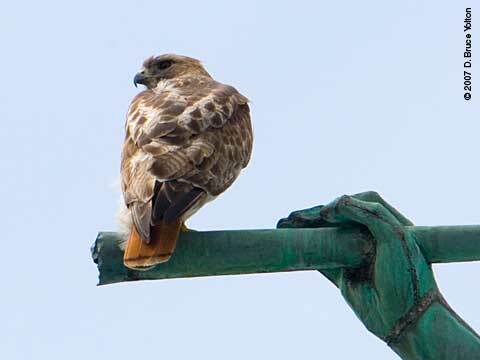 Update: Reports from other hawk watchers over the last few days is that both hawks have looked dry. 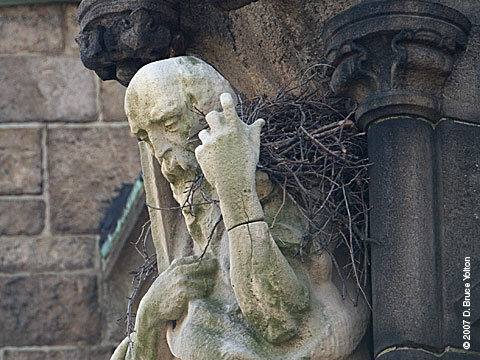 So, the verdict is that all is fine with the nest. 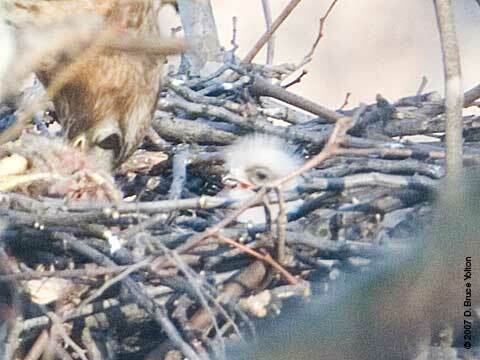 I'm happy to report that the Highbridge Red-tailed Hawk nest has at least two eyasses. 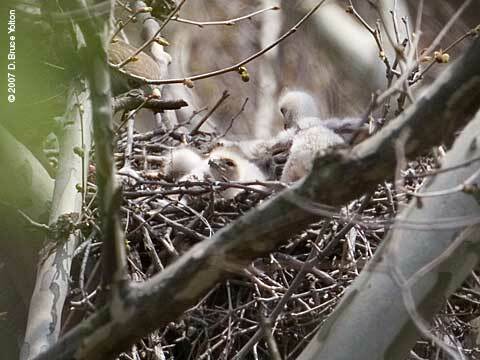 The second eyas is visible on the right. 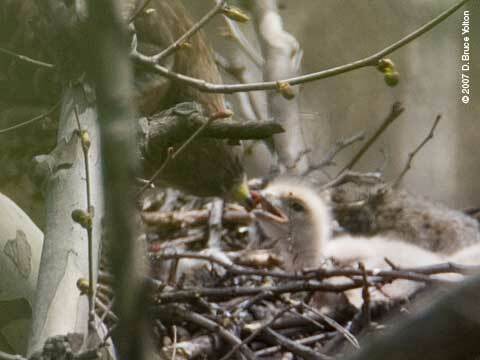 In playing back multiple frames, it was possible to see that there were two independent chicks and not just one bird. 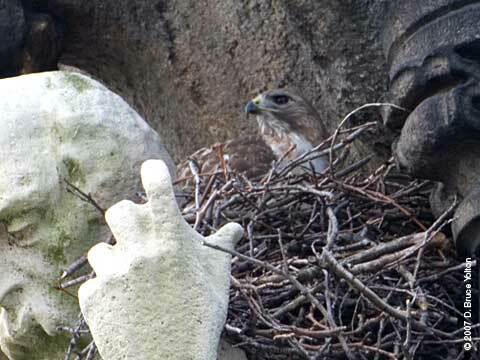 After two years of nest failures on 5th Avenue, all eyes are on the hawk nest to see if there are any signs of hatching. 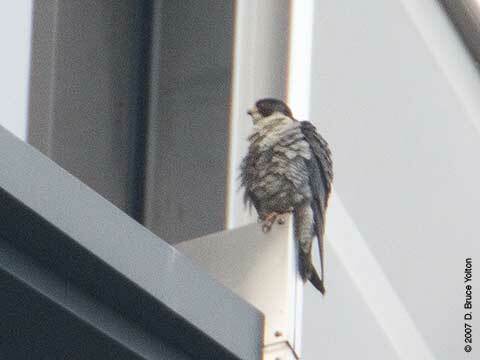 James Lewis has been keeping track of Pale Male and his mates for years and has compiled a chart of dates. 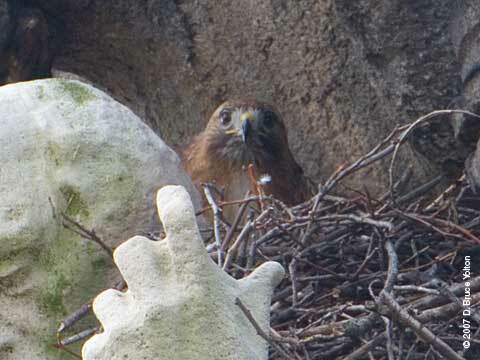 Since it is impossible to tell when the eggs are actually laid, Jim has measured the date between the first night the female hawk overnights on the nest and the day an egg hatches. 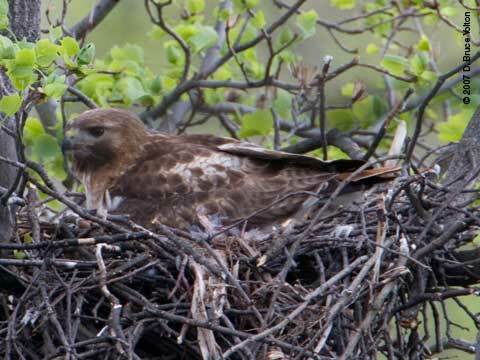 This date range has been between 35 and 41 days for the nest site. 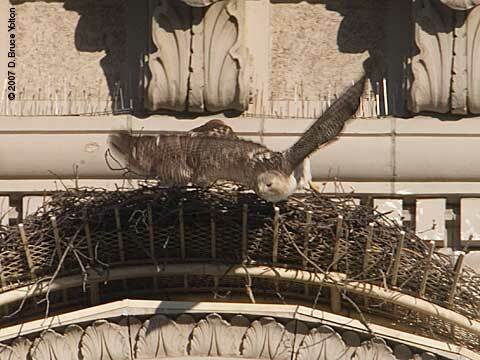 According to Lincoln Karim's Pale Male website, Lola spent her first night on the nest on March 9th. This would have made April 19th the 41st day. 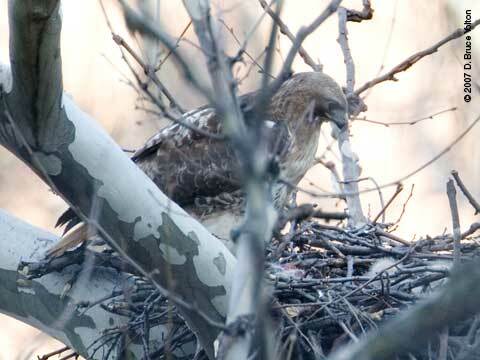 But Lincoln Karim, also observed that Lola, may not have stayed overnight on the nest on March 10th. So the start date may be the 10th or 11th of May. 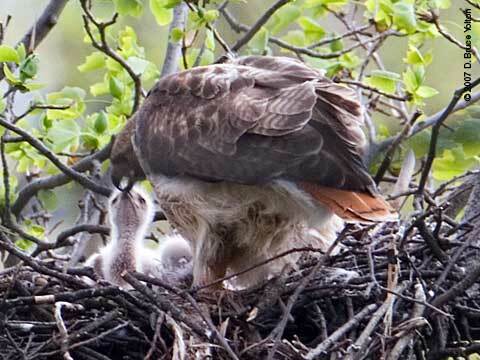 So, expect large crowds of nervous hawk watchers this weekend at the Model Boat Pond. 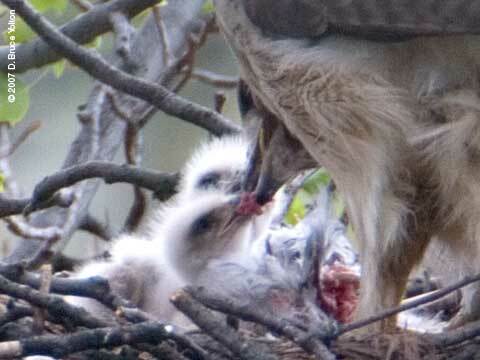 The pictures below are from Friday evening. 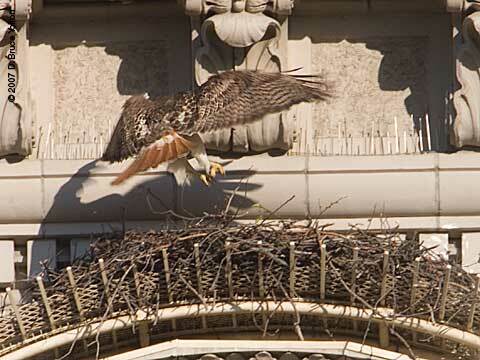 Pale Male was on nest, and the pictures are of Lola returning and Pale Male leaving and going off to his favorite Met security camera. 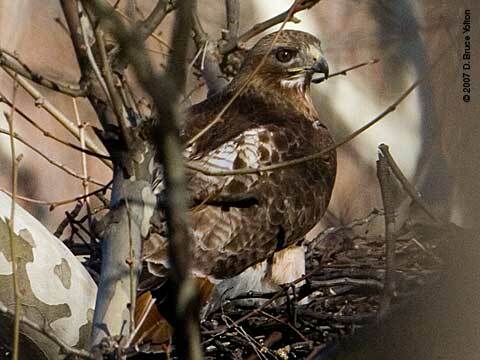 Red-tailed Hawk nests are the order of the day in New York City this year. 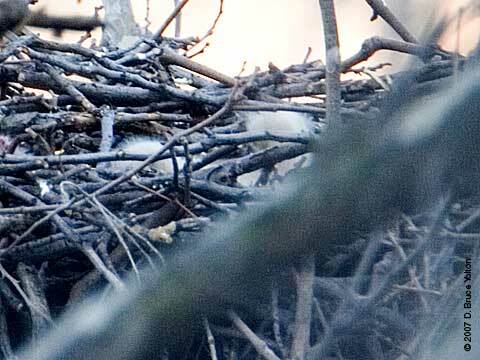 I think we have at least ten confirmed nests. 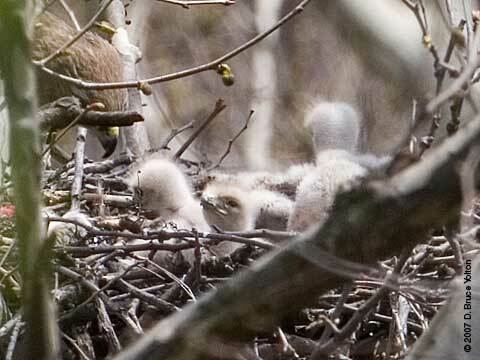 In the next few weeks, we should have lots of babies all through the city. 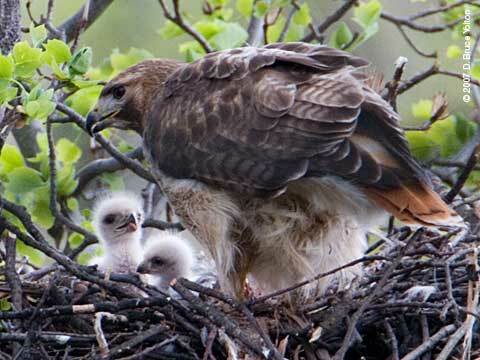 I'm going on vacation but will be back in time for some Red-tail babies. 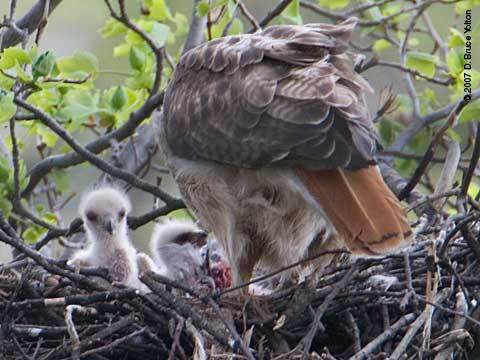 Beyond my reporting there are lots of excellent websites in New York with news of Red-tail nests. 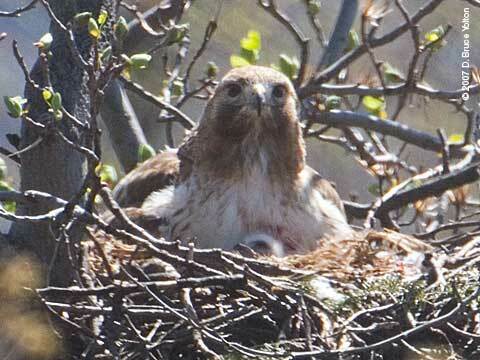 Rob Jett's City Birder blog has news of two nests in Brooklyn and news via Chris Lyons of hawks in the Bronx. 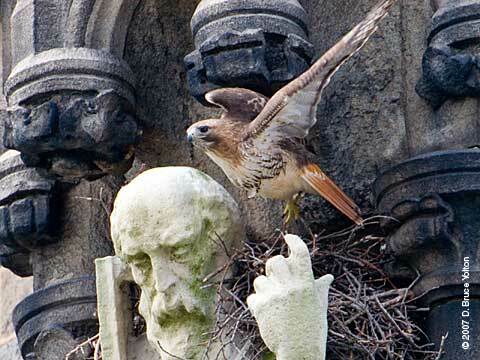 Robert B. Schmunk's Bloomingdale Village blog has been keeping tabs on the Cathedral Church of St. John hawks and other hawks in Central Park. 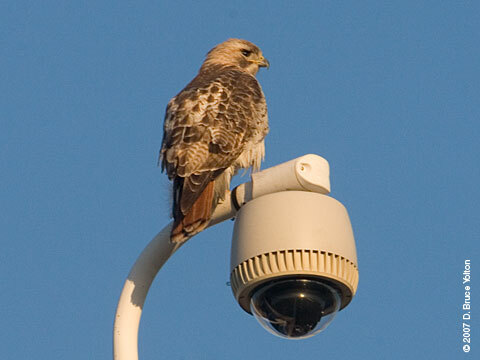 Jeffrey Kollbrunner's website has news of a pair of hawks in Queens. 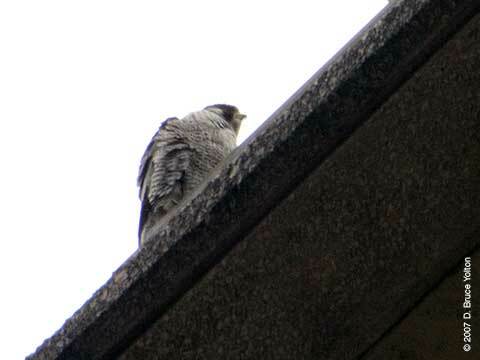 And if you're into Peregrine Falcons Ben Cacace blog, NYC Nova Hunter has been keeping track of a pair on Park Avenue and the 55 Water Street webcam is back online. 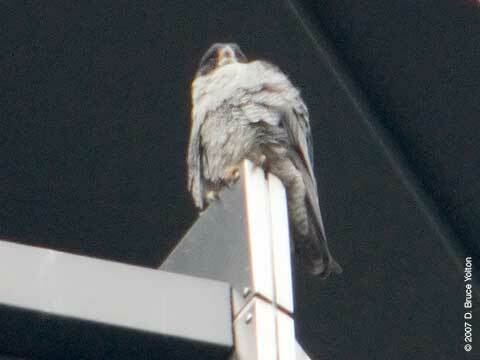 Plus, James O'Brien's The Origin of Species blog has news of American Kestrel, Peregrine and Hawk in midtown and Harlem. 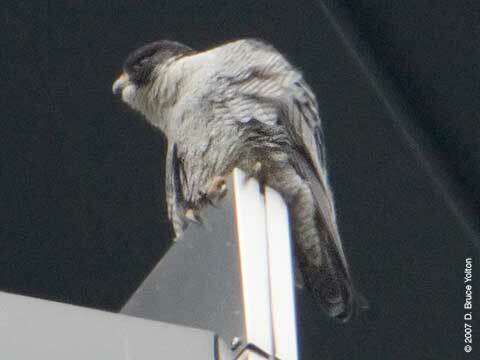 I continued to study the Peregrines on Park Avenue for an hour on Sunday. 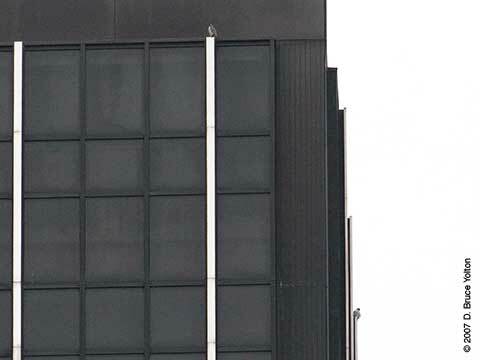 Both were on opposite corners of an eastern face of a building on the west side of Park Avenue. 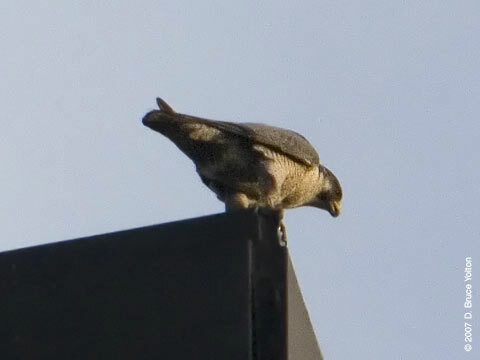 One was eating on the north corner and the other was hanging out on the south corner. 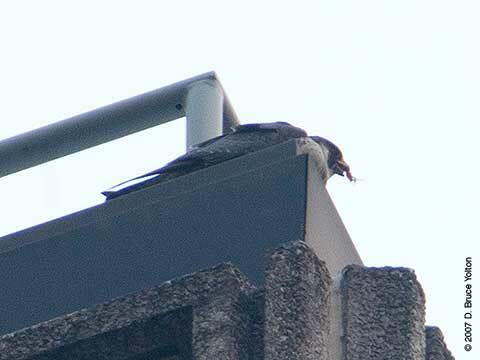 The one eating then moved to the Mutual of America building. 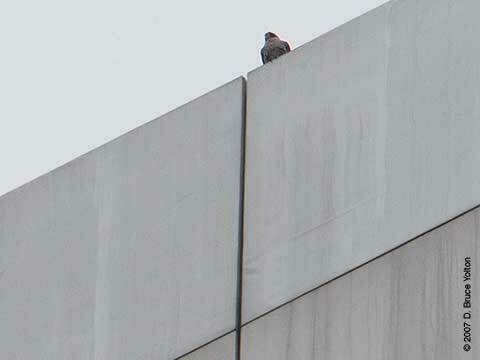 The Peregrine Falcon pair continue to perch on the buildings around the Waldorf-Astoria on Park Avenue. 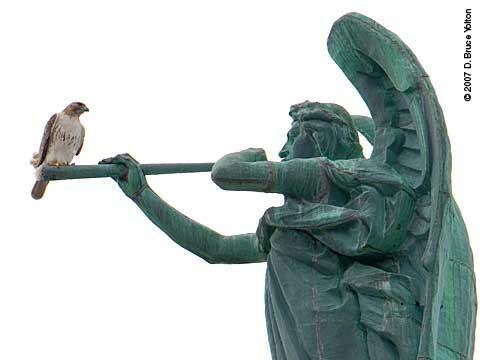 On Friday, I saw both of them flying around the Mutual of America building, and saw one perch on the former GE building, which now belongs to Columbia University. 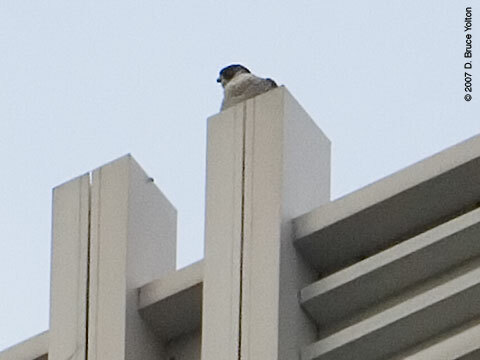 I was only able to get pictures of one of them on the top center of the Mutual of America building. 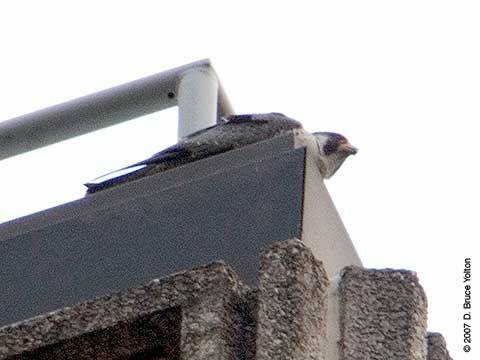 On Saturday, I went looking for the Peregrines and didn't find them. 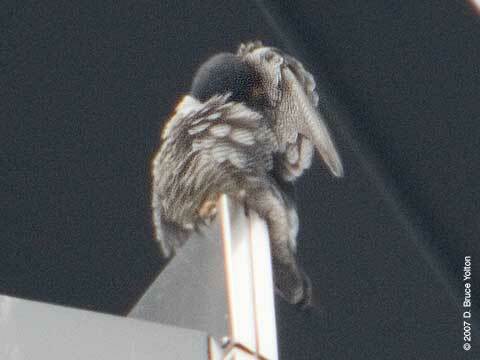 Luckily, I ran into Ben Cacace, who showed me one in plain sight on the Mutual of America building. 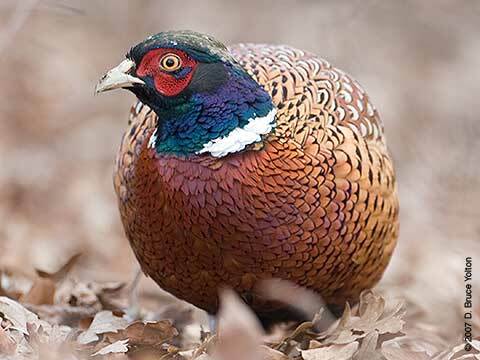 Later that day, Ben found the pair copulating. 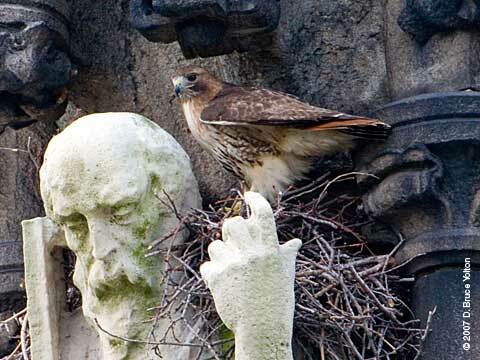 So, there may be little Peregrines on Park Avenue later this spring. 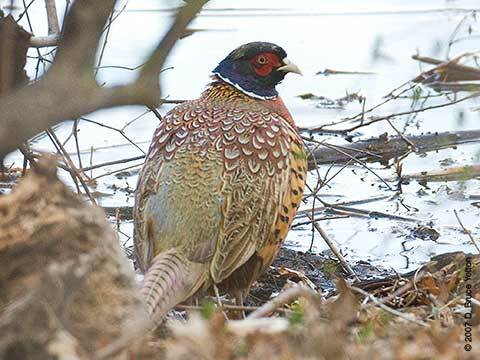 A male Ring-necked Pheasant was reported by Starr Saphir and Lenore Swenson on Wednesday. 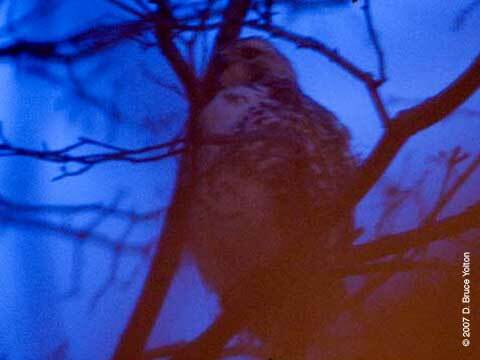 It was been staying in the area between Hernshead and Balcony Bridge, along the Lake. It was still there on Saturday. 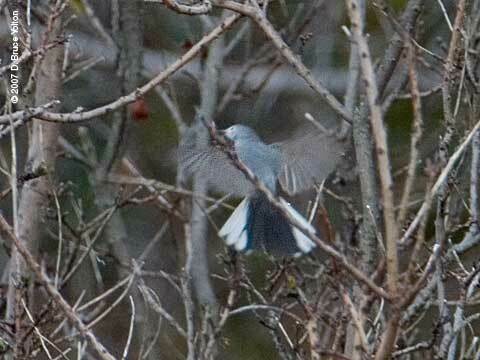 A new bird for my Central Park List. 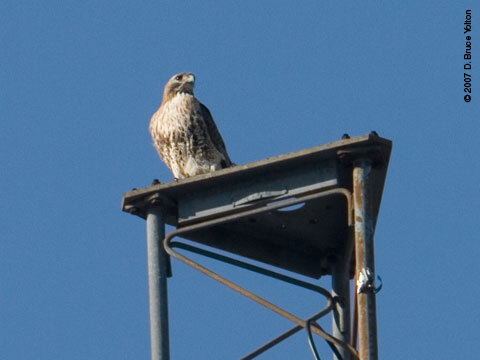 The Pool, The Loch and the North Meadow have a young Red-tailed Hawk this season. 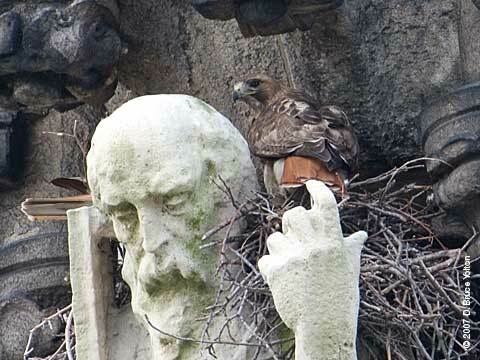 This young hawk is full of teenage enthusiasm. 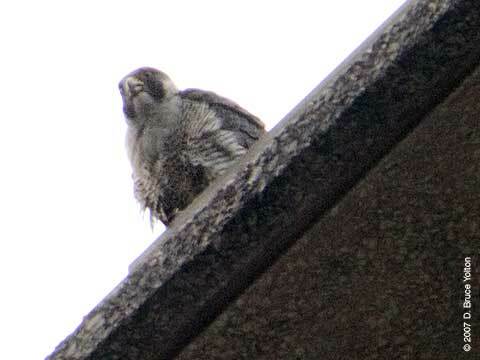 I posted pictures of this hawk last week hunting around the Pool.